The Old Man & the Gun – Film Review by Frank L.
This story is the largely true account of the life of Forrest Trucker, who was a recidivist bank robber. Bank robbers, presumably because of their bravura, often manage to generate a veneration from the public, notwithstanding their crimes. Not only was Forrest Trucker an habitual bank robber, he also had a facility to escape from prison, another quality which often is quietly admired by some law abiding citizens. Trucker in real life managed several escapes including one from San Quentin, San Francisco aged 72. He was a romantic figure. 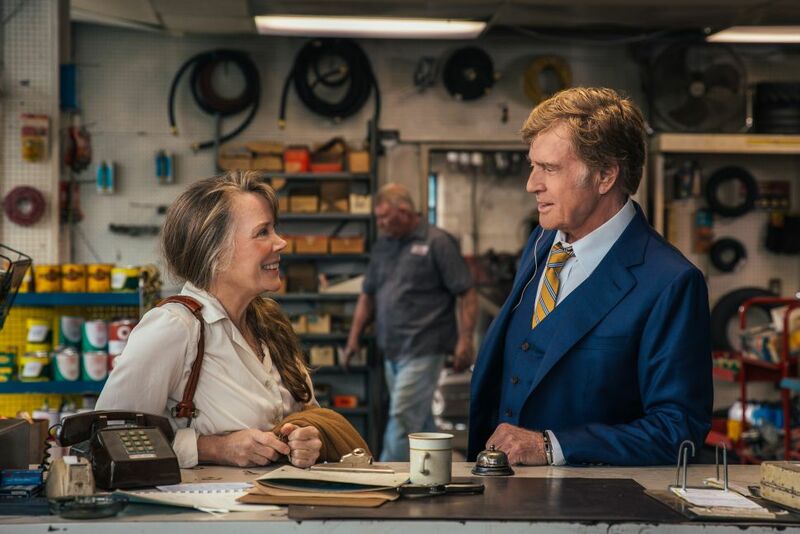 Robert Redford has charmed audiences for a long time on the screen. He says he started acting at age 21 and he is now 81. He has also stated that this will be his last film. As Forrest Tucker he is completely engaging as he with his butter-would-not-melt-in-his-mouth smile intrigues and enchants from the beginning. Cissy Spacek plays Jewel, a widowed woman of a certain age who Forrest as a good Samaritan helps on the highway when her car breaks down. Forrest uses his disarming charms on Jewel but she remains cautious if delighted by the attention of the enigmatic, handsome and mature Forrest. Spacek and Redford make an engaging couple as they move around each other. It is a beautiful piece of old fashioned courting. John Hunt, the cop, is played by Casey Affleck. He is a thorough, hard working regular guy. He is married to Maureen (Tika Sumpter) with whom he has two kids and he is still completely in love with her as his need to dance close to her demonstrates. Because there are several genteel bank robberies there are a series of cameos of various bank employees who are caught off guard by the charm of Tucker. Each one of these scenes are a delight to behold. Meanwhile, the relationship between Forrest and Jewel unfolds as John Hunt beavers away into Forrest’s past. As this is apparently Redford’s last film, inevitably one thinks of his legacy as you watch. The verdict must be that he has chosen wisely. In Forrest Tucker, Redford has a character in which his winning smile, even through the wrinkles, captivates. His ability for romance is all still there. All that has altered is the more halting gait not bad for an octogenarian. It is not difficult to see why Spacek’s Jewel is more than just interested in this new man of maturity in her life. Redford and Spacek generate a spark between them. They are great to watch together. They are not as demonstrative as Affleck and Sumpter, whose relationship is engagingly tactile. Undoubtedly there is an element of nostalgia coursing through this film but that is not a crime. Lowery has created a film which is comic and generates a feel good factor. It is a wonderful vehicle for Redford. He can be rightly proud of this film as his farewell to the screen, if it turns out to be just that. He would not be the first actor to have more than one “last” film. This film would be a fitting end to his dazzling career.